Join us for the WFME World Conference 2019 in Seoul ! 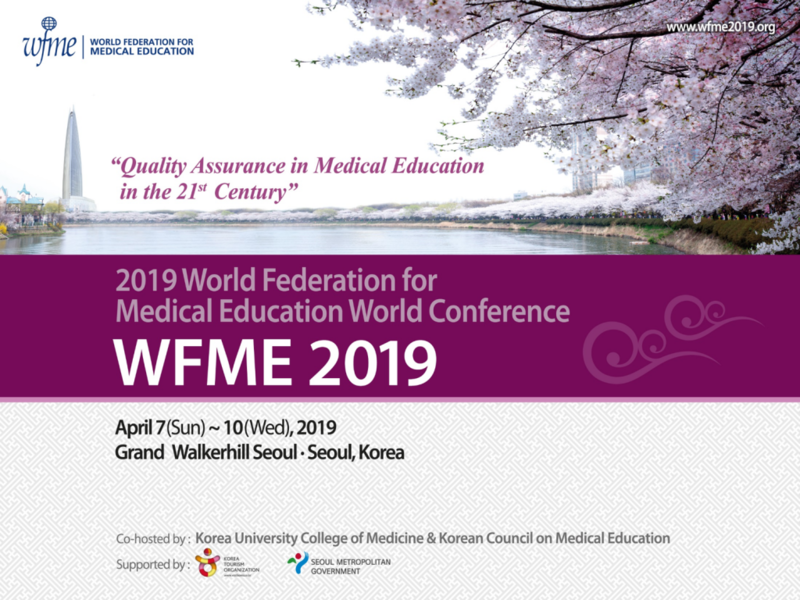 In April 2019, WFME will hold a World conference under the common theme of “Quality Assurance in Medical Education in the 21st Century”. We invite all interested parties to come and discuss together the challenges we are facing world wide and opportunities we have to improve the quality of medical education. We are looking forward to welcoming representatives of physicians, educators, researchers and students from all over the world. The scientific committee welcomes your submission of abstracts for the 2019 WFME World Conference. Abstract of original work related to quality development in medical education will be welcome. Accepted abstracts will be presented in the “Free Paper Sessions” and/or “Posters” during the conference. All abstracts must be submitted via the WFME 2019 Conference website at www.wfme2019.org from July 2, 2018. Sudan Medical Council (SMC) has been awarded Recognition Status by the World Federation of Medical Education. The SMC is the tenth accrediting agency that has received the WFME Recognition Status. We are glad to announce, that the Juniors Doctors Network (JDN) has became new official member of the WFME Executive Council at the EC meeting in Yogyakarta, Indonesia. The Junior Doctors Network (JDN) is the representative body for junior doctors and is related to the World Medical Association (WMA). Any junior doctor who is an Associate Member of the WMA may be part of the JDN, and although many are individual members, many are also representatives of their respective National Medical Associations. The International Federation of Medical Students’ Associations (IFMSA) (HCG) has worked with WFME and with the WMA for many years, and the JDN provides the natural progression and development of this relationship from the point of medical graduation to the time of completion of postgraduate medical education. The JDN has attended WFME Executive Council meetings as an observer since 2015. – is in alignment with WFME priorities and a closer relationship is expected to be beneficial for both organisations. In particular, cooperation with the JDN Education division will be of increasing importance to improve quality in postgraduate medical education and to promote accreditation of postgraduate education. The Independent Agency for Accreditation and Rating (IAAR), which operates in Kazakhstan, has been awarded Recognition Status by the World Federation of Medical Education. IAAR is the ninth accrediting agency that has received the WFME Recognition Status. In January 2018, the Australian Medical Council (AMC) became the eighth accrediting agency to be awarded WFME Recognition Status. In December, WFME President, Professor David Gordon attended the First Annual National Medical Education Conference in Ho Chi Minh City, Vietnam. Following the conference motto “Preparing the 21st Century Physician”, Professor Gordon argued that it is necessary to not only include basic sciences and clinical training in a medical programme, there should also be a small portion of the curriculum devoted to teaching ethics and medical law, which are clearly not optional, and other important subjects, such as health economics, anthropology and sociology.